Beautiful overview of Sta. Rita Hills blended from four outstanding vineyards. Vibrant aromatics and flavors. This wine is a superb representation of Sta. 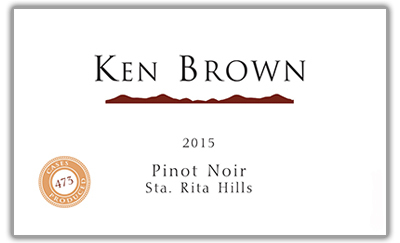 Rita Hills Pinot Noir featuring vibrant fruit aromatics and an intensely rich profile. Expressive aromas of black raspberry, cranberry and seashell are highlighted by hints of rose petal and pink peppercorn. On the palate, intense dark cherry and spice components give way to a velvety mid-palate and lush, lingering finish. The wine’s plush tannins and balanced acid profile suggest this Pinot Noir is poised to age gracefully for years to come. 43% Rancho La Viña, 29% Radian, 23% Rio Vista and 5% Sanford & Benedict. This wine is a beautiful overview of the Sta. Rita Hills, combining Pinot Noir from across the temperature zones of the appellation. Rio Vista Vineyard represents the eastern end of the appellation where temperatures are slightly warmer. Further west are Sanford & Benedict and Rancho La Viña vineyards situated in the heart of Sta. Rita Hills’ cool Pinot Noir zone. Radian is the coldest vineyard in the appellation. Its location in the southwest corner of the AVA is unsheltered from direct exposure to cold winds and fog from the Pacific. Pinot Noir clusters for this wine were hand sorted before being de-stemmed and gravity fed to fermenters. The must was immediately chilled for a pre-fermentation cold soak where the most beneficial extraction of color, aroma and flavor occurs. During fermentation, concentration was enhanced by gently punching down the cap several times per day. The wine aged 10 months in French oak barrels with 33% new French oak and was bottled on August 3, 2016.